So you have read enough about APRS (automatic packet reporting system also commonly known as automatic position reporting system) to pique your interest? If you have a background in Amateur Radio, you probably already have a reasonable idea of what is involved in using an APRS tracker in an aircraft. But if you are just now being exposed to APRS, no doubt you have some basic questions which will be addressed in this sticky. \nWHAT ARE THE LEGAL REQUIREMENTS FOR OPERATING A TRACKER? \nWant to see what is on a Technician exam? Use the link below to take sample tests....bet you already know a lot of the answers! \nSome APRS users have studied for the exam just by taking practice tests until able to consistent score a passing grade of 75 (well...maybe with a little cushion ). By using the "Back" button on the sample tests, you can keep hitting choices until you find the correct answer. Preparing for the Technician exam will not be challenging for anyone who has studied for a PPL written. \nA fee ranging from $10-14 is collected at the exam site, your test is graded at the site and you will know before leaving if you passed the exam. After passing the exam, your name and new call sign will appear on the FCC\'s database in a few days and you are then ready to transmit with your new APRS tracker. A paper license will arrive in the mail within a couple of weeks. \nOne caveat--since you now have an Amateur Radio License, not only can you operate your APRS tracker, but you may be tempted to delve off into the entire fascinating world of ham radio! \nHOW MUCH DO TRACKERS COST? \nOne of the appeals of APRS in our aircraft is the low cost of enjoying the service. Unlike the Spot satellite-based tracking service, there are no subscription fees associated with APRS. As a legal APRS user, you are simply a ham radio operator enjoying the privileges granted by your license to use the public airwaves. \nThe equipment costs can be very reasonable. There are two tracks often used when assembling an APRS rig. An aviator who is already a ham may elect to base his system on a 2-meter handheld transceiver already at hand. With the addition of a GPS receiver (may already be in the plane) and an encoder for preparing the GPS data for transmission, this operator is ready for using a simple APRS rig. Better performance will be attained with the addition of an external antenna which can be either concealed in a non-metallic area of the plane or external to the airframe much like a COM antenna. The cost of this installation will vary depending on the features of the transceiver and antenna used. One popular encoder is the Tiny-Trak which sells for less than $50. \nFor APRS users starting from scratch, the easiest avenue is to use a self-contained tracker. One unit that is very popular is the Micro-Trak RTG (Ready-to-Go)from Byonics that includes a single-frequency 2-meter transmitter. Add a GPS data feed and an antenna and your APRS rig is ready for action. Total cost in this case could be about $150 if you already have a GPS and use a homemade antenna, or around $200-300 if you purchase a new GPS and antenna. \nBut remember, once the APRS installation is complete, there are no additional costs for subscriptions. The data transmitted by your APRS tracker is relayed to internet servers which give anyone with internet access the capability to track your aircraft without incurring any service fees. \nHOW WELL DOES APRS WORK? \nThis is a valid question and one that is going to depend on several factors. When your APRS tracker is within clear reception range of digipeaters that pass the tracking data to the internet, the system works very well. There are, however, locations where APRS may be the victim of its own popularity which results in frequency congestion. This means multiple trackers (cars, weather stations, ships, etc) may be competing for airtime and some tracker beacons may get squashed. Local hams can probably be of assistance in assessing the APRS situation if you live in a congested area. But keep in mind that as airborne vehicles, our trackers can "see" for considerable distances, possibly beyond the edges of local congestion. It is not unusual for an airborne tracker to hit repeaters 200-300 miles distant. \nIf you are fortunate enough to conduct most of your flights where the extremes of the APRS situations described above are not a problem, you will be amazed at the accuracy and reliability of the APRS system. APRS can locate your aircraft with an accuracy equaling the resolution of the GPS, and we all know that is very accurate. \nUpdate 6/26/08: Based on the experience of several RVers who have used their trackers on long cross-country trips, it seems coverage over most of the US is very good. Problems due to lack of digi-peaters and frequency congestion have not materialized in a significant manner. The APRS network has proved to be robust and we should expect excellent performance from our airborne trackers. \nThere may be more questions you have about getting involved in the APRS community, but hopefully this sticky will point you in the right direction. Please feel free to post in the "APRS Tracking" forum; fellow APRS tracker enthusiasts (Track-o-holics?) will be most willing to assist you with setting up your APRS station. Be sure you read the "Welcome to the APRS Forum" sticky and also the thread that got this whole thing started on VAF. The APRS Forum index lists many threads relevant to APRS in aircraft. WHAT ARE THE LEGAL REQUIREMENTS FOR OPERATING A TRACKER? Want to see what is on a Technician exam? Use the link below to take sample tests....bet you already know a lot of the answers! Some APRS users have studied for the exam just by taking practice tests until able to consistent score a passing grade of 75 (well...maybe with a little cushion ). By using the "Back" button on the sample tests, you can keep hitting choices until you find the correct answer. Preparing for the Technician exam will not be challenging for anyone who has studied for a PPL written. A fee ranging from $10-14 is collected at the exam site, your test is graded at the site and you will know before leaving if you passed the exam. After passing the exam, your name and new call sign will appear on the FCC's database in a few days and you are then ready to transmit with your new APRS tracker. A paper license will arrive in the mail within a couple of weeks. One caveat--since you now have an Amateur Radio License, not only can you operate your APRS tracker, but you may be tempted to delve off into the entire fascinating world of ham radio! One of the appeals of APRS in our aircraft is the low cost of enjoying the service. Unlike the Spot satellite-based tracking service, there are no subscription fees associated with APRS. As a legal APRS user, you are simply a ham radio operator enjoying the privileges granted by your license to use the public airwaves. The equipment costs can be very reasonable. There are two tracks often used when assembling an APRS rig. An aviator who is already a ham may elect to base his system on a 2-meter handheld transceiver already at hand. With the addition of a GPS receiver (may already be in the plane) and an encoder for preparing the GPS data for transmission, this operator is ready for using a simple APRS rig. Better performance will be attained with the addition of an external antenna which can be either concealed in a non-metallic area of the plane or external to the airframe much like a COM antenna. The cost of this installation will vary depending on the features of the transceiver and antenna used. One popular encoder is the Tiny-Trak which sells for less than $50. For APRS users starting from scratch, the easiest avenue is to use a self-contained tracker. One unit that is very popular is the Micro-Trak RTG (Ready-to-Go)from Byonics that includes a single-frequency 2-meter transmitter. Add a GPS data feed and an antenna and your APRS rig is ready for action. Total cost in this case could be about $150 if you already have a GPS and use a homemade antenna, or around $200-300 if you purchase a new GPS and antenna. But remember, once the APRS installation is complete, there are no additional costs for subscriptions. The data transmitted by your APRS tracker is relayed to internet servers which give anyone with internet access the capability to track your aircraft without incurring any service fees. HOW WELL DOES APRS WORK? This is a valid question and one that is going to depend on several factors. When your APRS tracker is within clear reception range of digipeaters that pass the tracking data to the internet, the system works very well. There are, however, locations where APRS may be the victim of its own popularity which results in frequency congestion. This means multiple trackers (cars, weather stations, ships, etc) may be competing for airtime and some tracker beacons may get squashed. Local hams can probably be of assistance in assessing the APRS situation if you live in a congested area. But keep in mind that as airborne vehicles, our trackers can "see" for considerable distances, possibly beyond the edges of local congestion. It is not unusual for an airborne tracker to hit repeaters 200-300 miles distant. If you are fortunate enough to conduct most of your flights where the extremes of the APRS situations described above are not a problem, you will be amazed at the accuracy and reliability of the APRS system. APRS can locate your aircraft with an accuracy equaling the resolution of the GPS, and we all know that is very accurate. Update 6/26/08: Based on the experience of several RVers who have used their trackers on long cross-country trips, it seems coverage over most of the US is very good. Problems due to lack of digi-peaters and frequency congestion have not materialized in a significant manner. The APRS network has proved to be robust and we should expect excellent performance from our airborne trackers. There may be more questions you have about getting involved in the APRS community, but hopefully this sticky will point you in the right direction. Please feel free to post in the "APRS Tracking" forum; fellow APRS tracker enthusiasts (Track-o-holics?) will be most willing to assist you with setting up your APRS station. 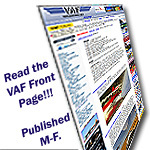 Be sure you read the "Welcome to the APRS Forum" sticky and also the thread that got this whole thing started on VAF. The APRS Forum index lists many threads relevant to APRS in aircraft.